Sprinkles denote the happy mood of Christmas. 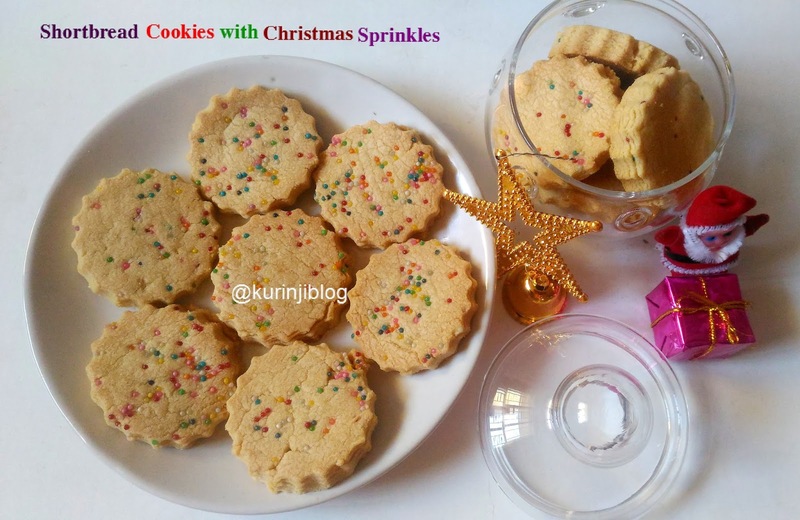 Cookies also denote the happy mood of Christmas. 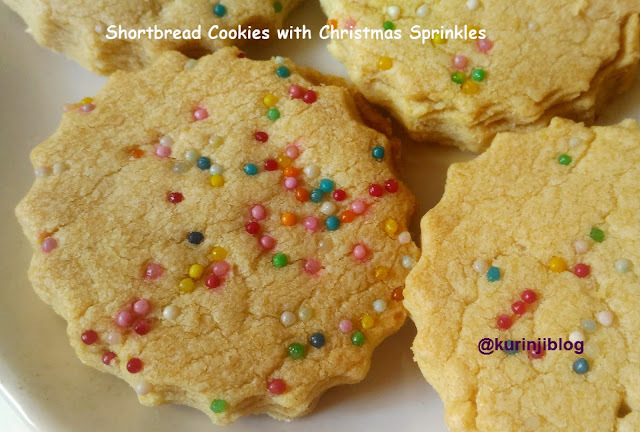 Hence sprinkle cookies doubles the fun of Christmas. 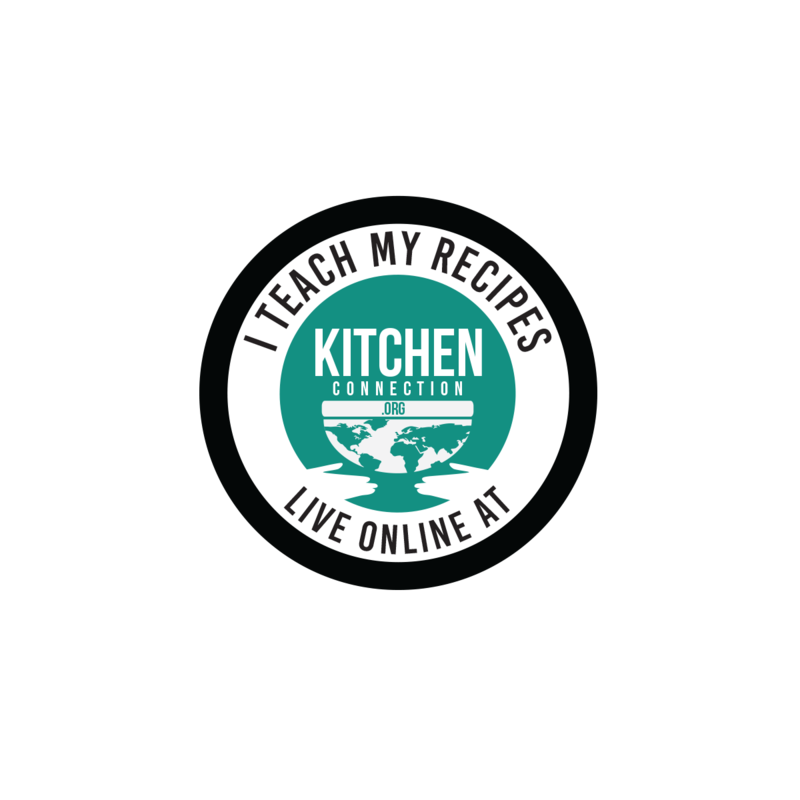 Click HERE to view my 30 + Cookies Recipe. 2. Take the butter from the refrigerator and beat it well with whisk or beater. Beat the butter till the butter becomes creamy without lumps. 3. Add powdered sugar with the butter and mix them well with spoon. Then beat them well with whisk until it will reach creamy consistency. 4. Add vanilla essence with the butter mixture and mix well. 5. Add wheat flour and mix them well with the help of the spoon. 6. Then knead them into a soft and pliable dough with your hands. 7. Cover the dough with plastic cover or airtight container and keep it in the refrigerator for 30 mins. 9. Then sprinkle the sugar-sprinkles over the sheet and again press them gently with the rolling pin. 10. Cut it into desired shape using the cookie cutter or bottle cap. 11. Take out the cookies using the flat spatula. 12. Keep the cookies on a ungreased baking tray with ½ inch distance between each cookies. 13. Preheat the oven for 160 degree Celsius. 14. Bake the cookies for 14 mins at 160 degree Celsius. 15. Add table salt in a thick kadai/pan and close the lid of the pan. Heat the pan for 10 mins in medium flame. This is preheating step. Don’t use non stick pans. 16. Keep the tray on the salt and close the lid of the pan. Keep the flame at very low. 17. Allow to bake for 20 mins. 18. Allow it to cool down completely in the tray itself. 19. Then take them out from the tray. Again cool them on wire rack. 20. Then store it in an airtight container for later use or serve it immediately. 1. Add enough salt, the baking tray should sit on the salt surface in the pan.